Founders Gate on a snowy day, year unknown. Although the Howe Street building was up to Principal Morrill’s standards, he had one last request – Morrill wanted a fence. He pressured the Board of Education, who then pressured the state legislature, who granted him $1,550 to complete project. The politically savvy Morrill convinced the state to erect an iron fence on the Howe Street side with a wooden continuation on the Oak Street side. He then asked the next legislature for enough money to replace the wooden side and complete the project. The plan worked and the iconic iron fence was completed. 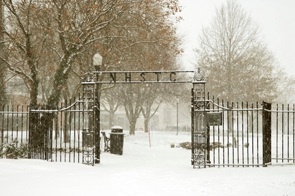 The cast-iron fence that once enclosed the Howe Street campus was now enclosing a parking lot for the Connecticut Mental Health Center. Robert Phipps, a historian at SCSU spotted the fence and suggested to art professor Robert Koch that the fence should be relocated to the new campus. Phipps unfourtunately died before anything could be done, but Koch mobilized Nathan DiFrancesco, advisor the class of 1972, Timothy J, Casey, class of 1973 president, and Richard Hegel, assistant director of Buley Library to join his cause. DiFrancesco located two craftsmen to restore the fence to its former glory. Installed in 1977 between Lyman Auditorium and Engleman Hall, the fence served as a Commencement Day landmark for some time, the graduating class walking through its gate.